I want to share with you about a fruitful tour that occurred in North Africa last month. The team I’ve been working with throughout central Asia the past few years, TACO, has launched a new initiative to reach students in North Africa. It’s not only a new initiative but we’re working with some key churches in a profound way. The first TACO team to go to North Africa and launch this initiative, Unishow, of which I was a part of in Turkey this past summer, was comprised of a band, two dancers and our world champion unicyclist. They reached 13,000 people with the gospel in just 10 days, with thousands of pieces of bible literature being given out. The team experienced such an impact that even new bible studies were started up for many interested students who attended the events! 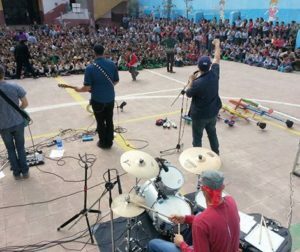 As I’ve seen many times partnering with TACO in doing creative performing arts outreach in that part of the world, throughout these recent performances in North Africa, God’s presence was felt as He did some pretty special things in many students’ lives. At one event, a girl’s high-end smart phone had had been stolen by boy during that actual program, leaving her absolutely devastated. Sadly, she was certain to face a beating as a result. Amazingly, after the show this kid realized how much God loved him and became so convicted that he confessed to the theft and returned the phone! In another instance, four boys snuck into the performance without paying the very minimal entrance fee. After the message, they confessed feeling God’s love, then confidently confessed to the leaders of their transgression and willingly paid their fee. According to local organizers, these acts of repentance are unheard of and a sign that God was at work in changing hearts. To my disappointment, I wasn’t able to join them, however, I was there in spirit as the team often had a giant screen with them where they showed video clips of my performance and message I developed just for the North African students. Due to the sudden transition in sending organizations, I had to postpone my involvement in this project. However, reactions from students were great and the individual event organizers have already asked when I can come… this time in person, of course. Seeing the wonderful work they did in organizing events, I can’t wait to serve with them! “From working with Adrian Van Vactor several times over the past several years we know he will add a key component to the North Africa tour team we’ve put together. The combination of a world class illusionist with our other artists is a hard combination to beat. Added onto that is Adrian’s unique ability as one of the best communicators I’ve ever met of the greatest news that has ever hit the planet. I am already scheduled to be in North Africa in the fall and have eager invitations to serve in South Asia as well as partnering with TACO. In fact, I was invited to join the team for tour 2 in North Africa as early as February! Planning is already under way. You can see some of the excitement in the event hosts towards the end of the video above. “We hadn’t been to North Africa for years and we wanted to move forward knowing that we we’re not just doing glorified entertainment but something on the cutting edge for the kingdom. After doing this ministry for 20 years in many countries, our ground team event hosts were the best national ground team we’d ever worked with. They had a vision to reach the whole country and are organized for the long term to work with us. It seems, for international projects, my efforts in reaching the nations is not going to pause in the least, but I need your support to continue this work. Secrets of the Supernatural Exposed – I’m writing a book along with Dr. Don Bierle, President of FaithSearch International. Outreach events throughout the U.S. with a focus on youth and college students. My goal is to reach $2,200 in monthly support by the end of 2015. I am 45% of the way there! That’s exciting. I need 35 new monthly partners to reach my goal. I would like to invite you to be a vital part of what God is going to accomplish through my ministry with FaithSearch in the coming year. Would you prayerfully consider making $35 monthly commitment so that I can continue sharing the gospel with evidence with thousands of people around the world? Of course, your monthly commitment of any amount is deeply appreciated. Thank you for reading and have a blessed Christmas! 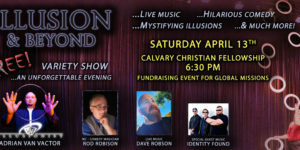 Adrian Van Vactor is an international award-winning illusionist, story teller, inspirational speaker and contender for the faith.